This European standard specifies requirements for high visibility clothing which is capable of visually signalling the user’s presence. The high visibility clothing is intended to provide conspicuity of the wearer in any light condition when viewed by operators of vehicles or other mechanised equipment during daylight conditions and under illumination of headlights in the dark. Performance requirements are included for colour and retroreflection as well as for the minimum areas and for the placement of the materials in protective clothing. EN ISO 20471 replaces the earlier high visibility standard EN 471. Collections for sale may include garments conforming to the standard EN 471 as well as garments conforming to the new standard EN ISO 20471. High visibility clothing is divided into three categories in terms of visibility, where class 1 is the weakest and class 3 the best. 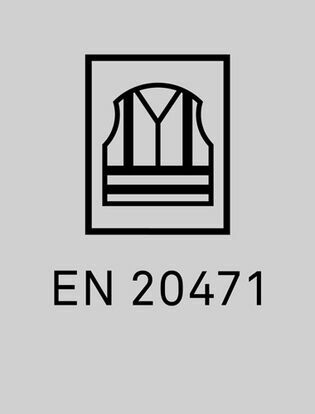 The upper figure in the high visible warning clothing icon indicates the garment class. 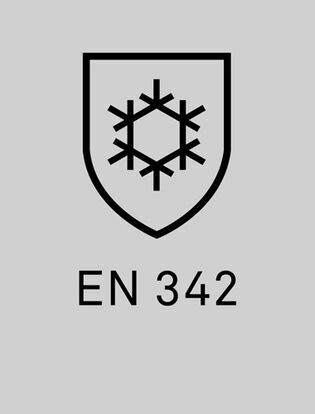 In the previous EN 471 standard the lower number indicates the reflectivity of the reflective tape. The minimum areas for the fluorescent background material and reflective tape for the different categories are shown in the table below. The required protection class must be decided case by case depending on the work and the environment. High Visibility protective garments must be washed separately or together with EN ISO 20471 (or EN471) certified products. Do not use detergents containing optical brighteners, chlorine, acetic acid or soap. To maintain the quality and performance of the reflective tape, we recommend washing the garments inside out and closing all fasteners before washing. Clothes should be washed sufficiently often to ensure best protection. Store garments in a dark dry place. The garments must be worn appropriately closed, and the fluorescent and reflective surfaces of the product may not be covered with other products. Protective clothing that does not continue burning when in contact with fire. This fire retardant clothing protects the wearer from excessive heat or flame or both. The clothing protects the user in short-term situations where the user is exposed to thermal radiation, heat from flames, or contact heat. The clothing must completely cover the upper and lower body, neck, arms and legs. The garments must be either one-piece coveralls or two-piece, such as a jacket and trousers. Additional protection like vests should be used together with the suit or ensemble; with the jacket and trousers. Protection classes D and E have additional design requirements. Outside pockets must have flaps with the exception of leg side pockets, fasteners must be protected with outside flaps. Protection class D and E outfits can be used in working environments where the user is exposed to splashes of molten metal. Class 3 is the highest level, Class 2 the intermediate level, and Class 1 is the minimum level. This type of protective clothing is intended for the protection of the wearer against spatter (small splashes of molten metal), short contact time with flame, radiant heat from the arc, and it minimises the possibility of electrical shock by short-term, accidental contact with live electrical conductors at voltages up to approximately 100 V d.c. in normalconditions of welding. The standard specifies requirements for both material and design. Material requirements include flame spread, which is being tested by applying a flame for 10 seconds to either the surface (Code A1) and / or the edge of the material (code A2). The after flame and glow time should not exceed 2 sec. The fabric should not drip molten material and there must be no holes. The seams of the garment must remain intact (test method ISO 15025). In the welding spark test Class 1 material must withstand at least 15 drops and Class 2 material at least 25 drops of molten metal before the temperature on the other side of the sample rises by 40 K. The material must not ignite (test method ISO 9150).The design requirements specify that garments must cover the entire upper and lower body, neck, arms and legs (eg. overalls or jacket and trousers). The clothes must protect the body in all the usual work positions within welding work. Conduction of electricity in the garment from the outer surface to the inner surface must be prevented e.g. metal fasteners must be protected. There are also precise requirements for pockets, fasteners and seams in order to achieve sufficient protection. When used properly, welding protective clothing protects the skin from UV radiation (UVA, UVB, UVC) occurring during welding work. However, usage may cause the fabric to “age” very rapidly. You can check the garment by looking at it on a weekly basis from about arm’s distance against a 100 W incandescent light bulb: if the light is visible through the fabric, UV-radiation passes through it as well. If employees get sunburn-like skin symptoms, UVB radiation passes through the fabric. In this case the garment must be repaired or replaced, or protective layers must be added. Additional protection e.g. leather sleeves, aprons, etc. increase the degree of protection of the garment. Protective clothing should be cleaned regularly according to the instructions, and garments should be checked after each wash. Do not wash the products with soap. Their protectiveness is maintained only when cleaned using synthetic detergents. Clothes must be washed with all fasteners closed, and separated from other laundry. The limited fire-resistance properties of the products deteriorate if they are saturated with flammable substances. If chemicals and flammable liquids are spilled on the garment, the user must exit the location and take the clothes off carefully, ensuring that a chemical or liquid does not come into contact with the skin. The clothing should then be cleaned or discarded. Wetness, humidity and sweat degrade the products electric insulation properties. A local rise in the atmospheric oxygen content impairs the fire resistance of products, this must be taken into account when working in confined spaces. Products must be worn appropriately closed. In order to achieve the necessary level of protection, a two-piece garment must be used as an ensemble. The best protection is obtained if the products are used together with other protective products like flame retardant underwear. These products alone do not protect against electric shock. This test standard specifies the material and protection requirements as well as the design requirements for arc protective clothing (the clothing does not protect against electrical arc hazards, it is not insulating clothing). The test method is the Box-test: voltage 400V AC, the test has 2 classes: Class 1 (4KA) and Class 2 (7kA). 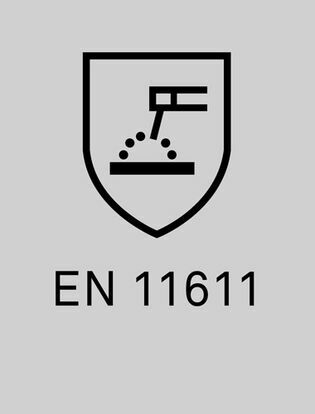 The garment will be certified according to the EN ISO 11612 standard. The arc test is carried out separately for the fabric and the garment. The energy passed through the fabric is measured, and the functionality of the garment’s fasteners is assessed visually. Design requirements: the garment should have no external metal parts, zips should be covered, the garment’s main seams have to be sewn with a permanently flame retardant thread, clothing protecting the upper body must have sleeves, additional articles of textile materials, such as eg. fleece collars or lining must at least meet the requirements in standard EN ISO 3 14116 index 3. 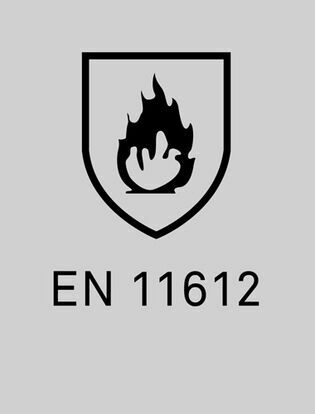 EN ISO 14116 classifies materials according to their flammability properties into indexes 1-3 (3 being the best). Type 6 (coveralls, for example jacket and trouser combination) and type PB 6 (partial body covering, for example jackets). Chemical protective clothing offering limited protective performance against liquid chemicals. Limited use chemical protective clothing is intended for situations where the user may be exposed to low level sprays, liquid aerosols or small splashes, which do not require complete protection against liquids (on molecular level). Chemical protection must be renewed in connection with every 5th wash at an industrial laundry. Multinorm-garments fulfil the requirements of this standard. Multinorm-garment material is tested with the following chemicals: Sulphuric Acid H2S04 30 %, Sodium Hydroxide NaOH 10 %, O-xylene, Butan-1-ol. Part 5. Material performance and design requirements. 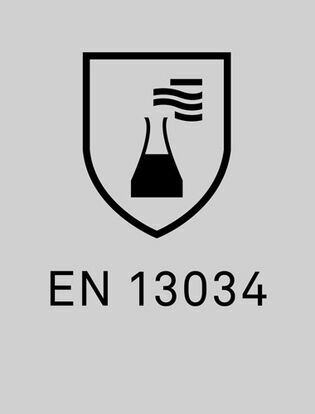 The European standard EN 1149-5 is a part of the standard kit that includes test methods and requirements for electrostatic properties of protective clothing. The standard 1149 part 1 (surface resistivity measurement method) and part 3 (discharge measurement method) are testing standards for materials. Part 5 specifies material and design requirements, garment labels and instructions for use. Material must meet the requirements of parts 1 or 3. The design requirements specify that the conductive material must cover all the underlying “non-antistatic” layers; accessories, such as reflexes and logos must be properly secured (must not come loose from the garment), conductive parts such as zips and buttons should be covered with a conductive material during use. The user must be properly grounded eg. by using discharging or anti-static dissipative footwear. Clothing should not be kept open or taken off in premises or situations where there is a risk of ignition or explosion. Clothing should not be used in oxygen-saturated conditions without permission of the person responsible for safety. The protective properties of the garment may be weakened through use, wear, washing or contamination. The standard specifies requirements and test methods for cold protection garments (overalls or two-piece suits), as well as individual items of clothing. Cold means below -5 ° C together with moisture, wind, and thermal radiation. Clothing is measured under specified conditions, together with specific underwear, for thermal insulation, air permeability, and, if necessary, water resistance and water vapour permeation resistance. Garment labels should state the thermal insulation and air permeability values. The garment comes with an instruction manual, which provides guidance on how these values apply to potential situations. Garments are designed with the consideration of general ergonomic requirements for protective clothing. This protective clothing is suitable for the normal autumn / winter conditions. Products should be worn and closed properly in order to yield the best protection. A wet, broken or dirty garment does not meet the product requirements. Garments for protection against water and sleet, rain, fog, or ground humidity. The materials and the seams of the garments have been tested for water and water vapour permeationresistance. 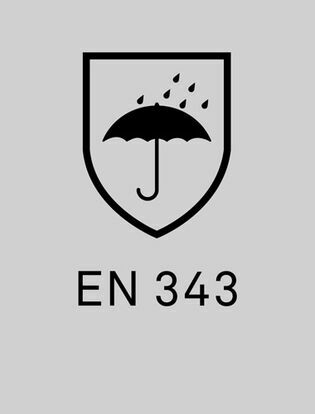 The waterproofing and breathability values for these garments are stated on the label next to the umbrella pictogram (classes 1-3, the best 3).